Wooden bicycles can be found all over the world. These handmade bikes are often larger-scale scooters that you sit on. 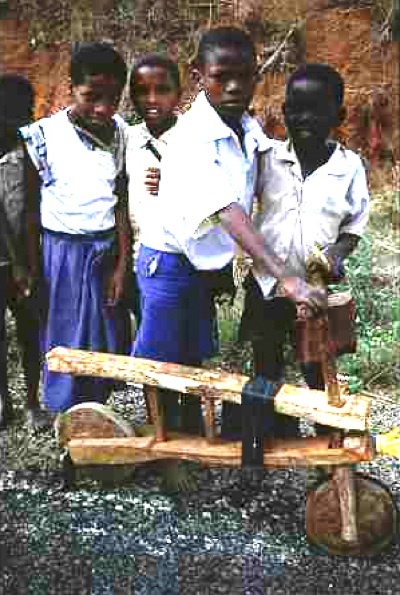 Made with whatever wood can be found, they use small wooden home-made wheels covered with discarded rubber rims. Forward movement depends on the rider pushing with their feet. 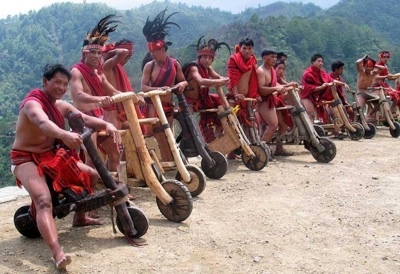 These wooden bicycles are ridden in the Banaue region of the Philippines. 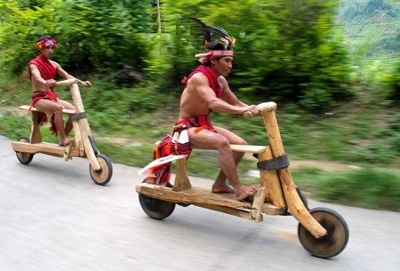 During an annual festival celebrating the culture of the regional tribes, wooden bikes are raced by participants in native costume. Notice the cool foot-activated brakes. These photos are from the Flickr pool of Harry Palangchao. 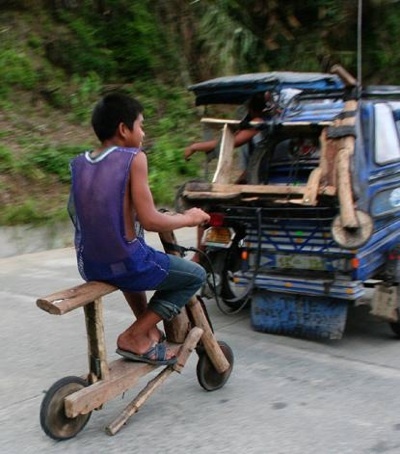 This kid bike is also found in the Philippines. This one too has a foot-actuated drag brake. The ones above are found in Burundi and were taken by Will Okun. 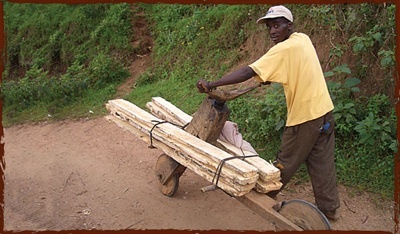 These wooden bike scooters are used to haul cargo. Pushed up hill and then ridden down. Same idea in Ruhengeri, Rwanda. From Peter Strong at Camelworld. 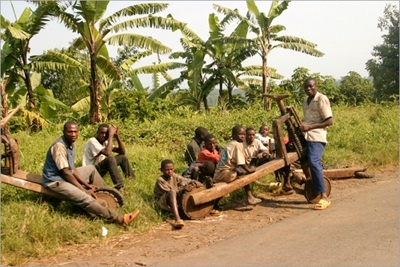 Wooden bike-truck in Goma, Republic of Congo. This one was found in Gikongoro, Rwanda and photographed by Louise Batalla-Duran for Wandering Spirit Travel Images. 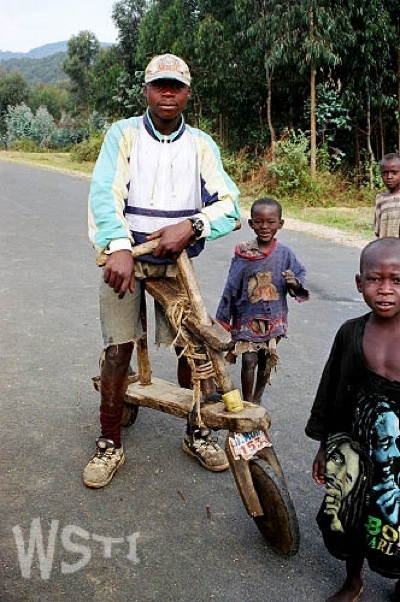 Kids made their own bike in Tanzania. Note the yellow plastic “headlight.” From Wooden Bicycles in East Africa. 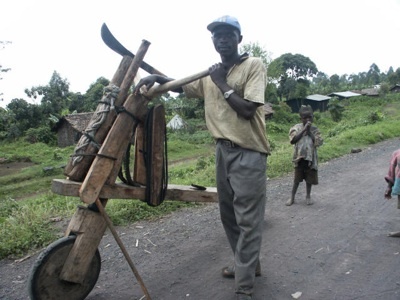 In Rwanda this farmer uses his wooden bike to haul lumber. Turns out there is a wonderful non-profit set up to help spread the technology and use of simple load-bearing bikes. 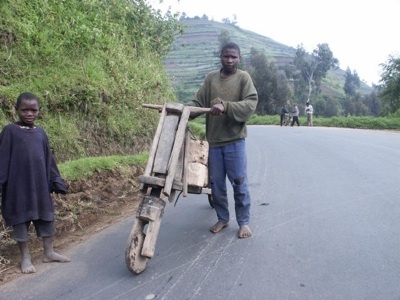 The Coffee Bike Project will donate rugged metal bikes to coffee farmers in Rwanda to aid them in getting their beans to market.